The PGM Portable Gas Meter is an inexpensive, battery-operated gas analyzer. Its compact and lightweight size makes it easily portable and ideal for applications such as landfill, compost, agriculture, biological incubators, mining and scientific research. The PGM Portable Gas Meter can simultaneously measure O2, CO2, and CH4 gases evolving from biological or ground sources within compost or landfill and can measure concentrations of O2, CO2, and CH4 in the range of 0 to 100%; other ranges are available as an option. The PGM Portable Gas Meter is equipped with its own air sampling pump and utilizes an infrared gas analyzer for measuring CO2 and an electrochemical fuel cell for O2 measurements. The life span of the O2 sensor cell is 5 years, while the CO2 sensor will work indefinitely. The gas analyzer’s response time is approximately 30 seconds. The instrument consists of two parts, the O2/CO2/CH4 meter and a rechargeable battery pack with charger. A single charge of the battery pack provides 24 hour operation at 50% pump utilization. Subsequent battery packs may be purchased to insure on-going instrument operation for extended periods. An optional power supply is offered for power line operation. 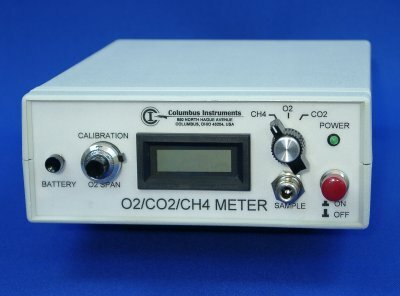 The Columbus Instruments portable O2/CO2/CH4 Meter uses infrared gas analyzers for CO2 and CH4 and an O2 fuel cell to measure a wide range of gas concentrations. CO2 sensors and 8 hours with O2, CO2 and CH4 sensors. The Columbus Instruments O2/CO2/CH4 Portable Gas Meter incorporates infrared CO2/CH4 sensors and a GS oxygen sensor. The infrared sensor optics comprises a robust infrared source, a gas sampling cell, two infrared filters and a matched twin element detector. The infrared source is the hot filament of a tungsten lamp emitting a broad band of radiation that is then guided through the gas in the sample cell. The radiation then passes through either of two filters. The two filters are selected so that one is coincident with the gas to be measured and the other is independent of any gas likely to present in the cell. In the absence of CO2 gas the energy reaching the two detectors is equal and at a maximum and as the sample gas concentration increases the amount of infrared radiation reaching the two detectors differs due to absorption at one filter wavelength only. The microprocessor gives the gas concentration, automatically compensated for source intensity changes or contamination of the optical elements. The output signal from the CO2 sensor is proportional to CO2 concentration. The GS oxygen sensor incorporates a lead oxygen cell with a lead cathode, using a specific acid electrolyte. Oxygen molecules diffuse through a non-porous Teflon membrane in to the electrochemical cell and are reduced at the gold electrode. The current flowing between the electrodes is proportional to the oxygen concentration in the gas mixture to be measured. The signals are measured as terminal voltages of the resistor and the thermistor for temperature compensation. The change in output voltages represents the oxygen concentration.